In what had to be one of the most dramatic games of the season, the Breakneck Betties’ Beyond Thunderdame scored eight points in the last jam to beat the Heartless Heathers by just one point—a point that allowed the Betties to leave The Hangar with their undefeated record intact. Heading into the bout, the Betties were in first place and the Heartless Heathers in second. The last jam was the culmination of a hard-fought bout that saw eight lead changes. The Betties were leading for most of the first half, but only by an average of 3 points. The Heathers’ defense with Tarantula, Nacho Lucky Day, Bella Constrictor, and Stan the Woman prevented the Betties’ top jammers from having big scoring runs and never let the Betties build a lead of more than 10 points. On four occasions, the Betties’ made star passes to keep the Heathers from getting the lead. With less than ten minutes left in the half, the Heathers took the lead by winning lead jammer four times in a row for a 20-0 point run. The Betties’ came back in Jam 19 when Gal of Fray— who led all scorers for the night with 70 points—took the line against the Heathers’ Freddie HerFury. Freddie got lead jammer almost immediately but was called for a track cut penalty. On the way to the box, Freddie was called for a misconduct penalty, giving Gal a full minute as the lone jammer. In that time, she amassed 12 points before Freddie returned to the track. Mia Palau led the Heartless Heathers in scoring with 50 points for her team. Photography Credit: Regularman Photography. Anxious to get back and stop the Betties’ momentum, HerFury committed a back block penalty and was sent back to the penalty box. Once the full two minutes of the jam were up, Gal had scored 20 points and put her Betties back in the lead (66-59). In the next jam, the Heather’s defense held Ovarian Barbarian as Freddie returned from the box, got lead jammer, and scored 10 points to send the Heathers into halftime with a lead of 81-70. The second half saw the Heather’s hold onto their lead and add to it. In Jam 2, the Betties’ Gal of Fray narrowed the gap to two points 2 points (88-86), but that’s as close as the Betties would get for the next 15 minutes as the Heathers’ defense bottled the Betties up. By Jam 7, the Heather’s had built a 24-point lead, their biggest of the game. The tough defenses played by both teams culminated in Jam 10. The Betties’ Abra Kadaver and Heathers’ Tegan N Scare-Ya (Ya-Ya) pressed hard against the tight brace walls, led by Gingeraffe, Tenacity, Justine Tipp, and newest teammate Toxic Haste for the Betties and by Adrenaline Crush, Faye Tality, Bella Constrictor, and Tarantula for the Heathers. It took almost a full minute before Kadaver squeezed past the wall to get lead jammer. Coming around, she ran into the wall for a second time. Ya-Ya had no such luck on her initial pass as the Betties’ defense responded to her efforts to go around or through the blockers. By the time the jam ended after a full two minutes, the pack only made two turns around the track and the Betties only got four points for their efforts. It never felt as though either team was able to build or hold onto significant momentum in the second half, while the Heather’s held onto the lead. In Jam 17, Gal of Fray took advantage of a penalty on Mia Palau and put the Betties back in the lead (128-125). Despite having the lead, the Betties’ found themselves down 3 blockers to start Jam 18: only Tenacity was on the track versus Heather’s Jammer Ya-Ya. Despite this, Tenacity held Ya-Ya for a full 30 seconds—precious time that included two big knock-outs and recycles. Ya-Ya was only able to get through the pack after Beyond Thunderdame had acquired lead.  The jam was called as soon as the Betties’ had emptied the penalty box of their skaters. No points were awarded, but the momentum tipped toward the Betties. In the next jam (Jam 19), the Betties’ Ovarian Barbarian had a two-blocker advantage and was able to get past Nacho Lucky Day and Bella Constrictor for the lead. In the 1:30 jam, O.B. scored 10 points to give the Betties’ their largest lead of the half, 138-129. 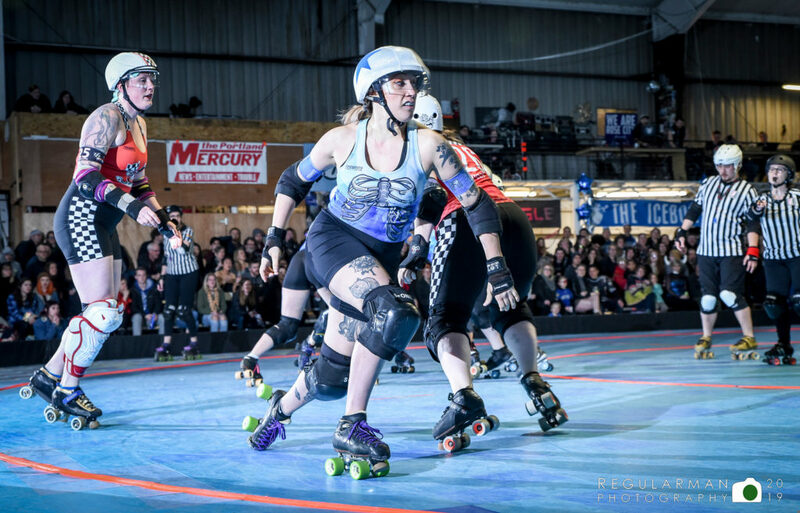 The Heathers weren’t going to go down that easy, though: Mia Palau took the line in Jam 20, jetted to lead, and scored four points thanks to strong defense of teammates Stan the Woman, Adrinaline Crush, Tarantula, and Nacho Lucky Day. In the minute-long jam, Mia had scored 16 points and had taken back the lead for the Heathers, seemingly for good. With 19 seconds left on the clock, the Heathers lead with a score of 145-138 . . . and then Beyond Thunderdame stepped up to the jam line. 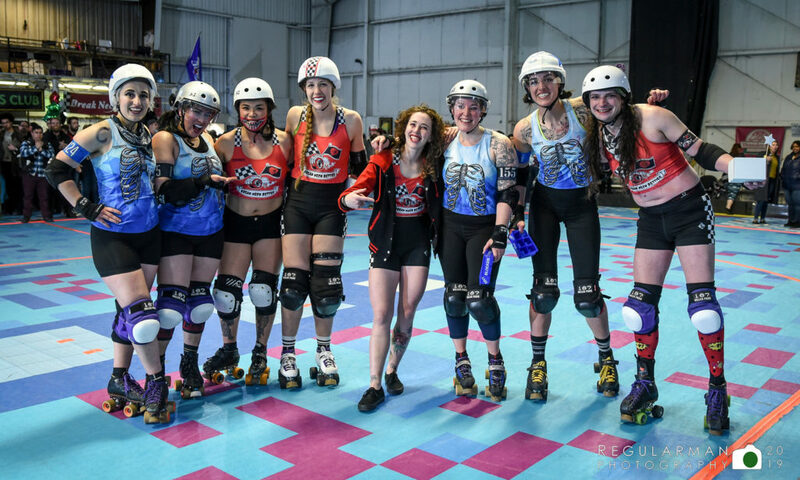 From left: Tegan N Scare-Ya (captain), Adrinaline Crush (captain), Yermom’s Favorite (MVP Blocker), Tenacity (captain), Sprout (captain), Bella Constrictor (MVP Blocker), Freddie Herfury (MVP Jammer), Beyond Thunderdame (MVP Jammer). Photography Credit: Regularman Photography.